Adsafe Doors has been repairing aluminium sliding doors and timber sliding doors for many years in the Lane Cove area and we have many satisfied customers. If your sliding door is jamming or scraping and is difficult to move or maybe just not locking properly or it just keeps coming off the runner then we can repair it. 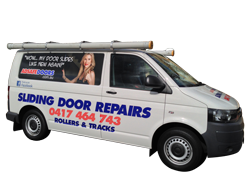 We have the experience and no how along with the quality parts necessary to repair all brands of Sliding Doors in Lane Cove. The result is you will be guaranteed to be able to open & close your sliding door with ease, quietly and smoothly. Adsafe Doors have brought back to life, by servicing and repairing thousands of Tied and worn-out old Aluminium Sliding Doors and Timber Sliding Doors in Lane Cove and in fact all of Sydney. In the Lane Cove area, we have hundreds of satisfied customers from Longueville to Wollstonecraft to St Leonards to Lane Cove North and Lane Cove West. We have been servicing and successfully repairing Sliding Doors in the Lane Cove region of Sydney since 1990 and our long history of servicing sliding doors has given us a familiarity with all the different Sliding Door Brands and conditions for Lane Cove region. Our goal is to enable our customers to be able to use their Sliding Doors with an ease of opening and closing, which is better than it was when new. In other words, you should be able to open your door with one finger and it should slide easily. And finally, our repair should last for many years to come. Our repair is guaranteed because all our work is based on years of experience in the Lane Cove area. We only use quality door repairs parts. This gives you confidence in knowing that your hard earned money has been put to good use in servicing and rejuvenating your Sliding Door. You will feel comfortable knowing your repair will last for many years. We have a record of every brand of Aluminium Sliding Door in the Lane Cove area of Sydney. We very familiar with each of the problems that those brands of sliding door are likely to have. This is because we have been servicing and repairing Aluminium Sliding Doors for many people in the Lane Cove area over many years. Due to repairing hundreds of doors every year, we have developed a unique strategy to repair each particular brand of Sliding Door. From your initial phone call with us, we determine the size and the specific issues that you are having with your sliding door and if possible we try to identify the brand of door. Then we remove the door and put it on the edge so as to examine the condition of the rollers and the bottom rail which holds the roller carriage. When the Sliding Door and panel are both back in place we then adjust the lock and door so as to slide and lock correctly. When you have tested and are satisfied with the operation of the Sliding Door we clean up. With 20 years experience in Aluminium Sliding Doors, we are able to bring a level of professional repair, quality of workmanship, with a proven track record to door servicing that is second to none. This inevitably will only result in more expense later down the track. Its a vicious cycle. 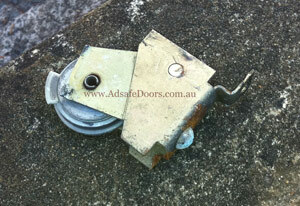 Tyres just break and crack and bearings wear sometimes releasing their balls into the threshold channel. And then one day with mounting frustration and a push of the door the roller gives up and collapses making your door impossible to move. Our advice is to have your sliding door serviced by a competent and licensed tradesperson only when your door starts to get noisy or difficult to move, because you don’t want, what could be minor damage becoming major and expensive damage. If your sliding door is noisy then your rollers could be in the same bad condition or even worse than the roller in our image. So please feel free to call us, so as to discuss with you a time to service your sliding door. The door will not move. The carriages and rollers have completely collapsed onto the track causing the track to become badly worn and then damaged. After we fitted the new rollers and installed the new track the door was sliding better than new, we achieved an excellent result with this door, the door was sliding and locking perfectly. This is the most common type of sliding door repair problem that we find in Lane Cove and as you can see we can repair the door so that it slides perfectly.